Your hard drive churns. Every click sets off a spinning beachball. Disk Utility doles out the bad news. When your hard drive’s end is near, your best hope is a good backup. Of course it is. But, what if you don’t have a backup? Or what if you thought you had a backup and it failed? At this point, someone will say, knowingly: “You should have had redundant backups.” Shoulda. Woulda. Coulda. You shoulda, you didn’t. So, what now? Keep calm and consider your situation. The fact is, intentionally or not, you probably do have backups of at least some of your data. Do you use Webmail or IMAP for your email? If so, then you don’t need to worry about your email messages; they’re safely stored on a server. When you repair or replace your failing Mac, all you’ll need to do is enter the information for your email accounts in your email client, or use a Web browser if you use Webmail, and the messages will download. 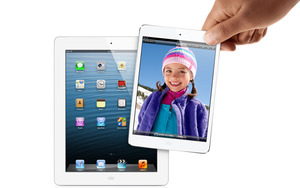 Have you used Apple’s iCloud to sync your email, calendars, Safari bookmarks, reminders, or notes? If so, don’t despair. 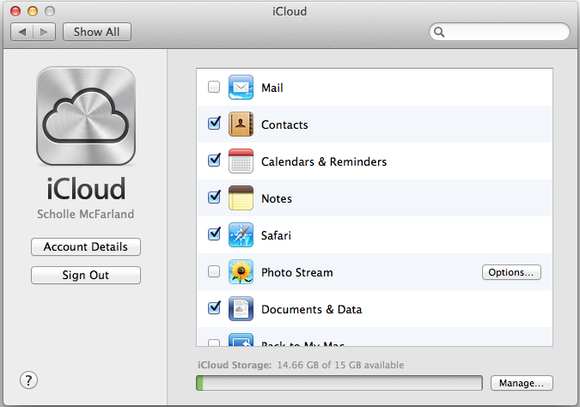 On the new or repaired computer, go to Apple Menu > System Preferences and choose iCloud. Sign in to your iCloud account and check the relevant categories (Contacts, Safari, Calendars & Reminders). Your information should appear. If you've used Apple's iCloud, you can restore any data you synced after you get your Mac working again. Do you use Dropbox or Google Docs to make it possible for you to see your documents no matter what computer you use? Students, for instance, may store papers in Dropbox so they can access them through a Web browser at school. Or your business may use Google Docs to make it easy for coworkers to collaborate. These files are just where you left them in the cloud; you simply sign back in to the account. If you’ve been using an up-to-date version of Dropbox, it’s likely the service has also been backing up your photos automatically whenever you connect a USB camera, iOS device, or memory card (provided that you haven’t turned down its request to do this). Download a copy of Dropbox’s mobile app to your iPhone, iPad, or other mobile device and check. If most of your music was purchased through iTunes, it’s easy to restore your library. First, make sure that you’re signed into iTunes with the account you used to purchase your media. 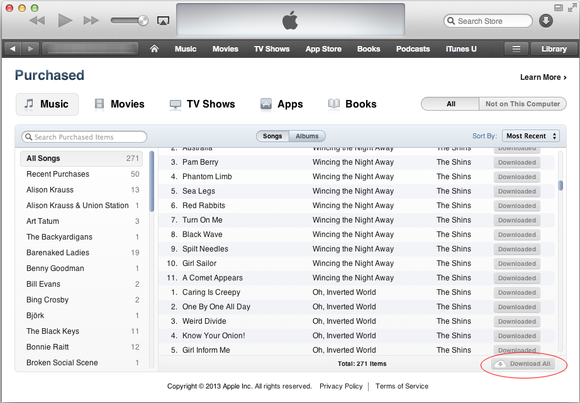 Now click on the iTunes Store button in the top-right of the iTunes window, and click the Purchased link that appears below on the right side. In the resulting screen, click the Music tab and then the All Songs entry. All the music you’ve purchased will appear in a list. Click the Download All button to download all your past music purchases. You can also redownload purchased movies, TV shows, TV seasons, and books using this same technique. Your purchased music is not lost. In iTunes, you can redownload purchased music, movies, TV shows, TV seasons, and books. If you subscribe to the $25 per year iTunes Match service, then you can download any music that you’ve either matched or uploaded. You might be carrying copies of important data right in the palm of your hand. At the very least, your iPhone probably contains a chunk of your photo and music library. Your photos: Your photos will download automatically when you connect your iPhone to the new computer. 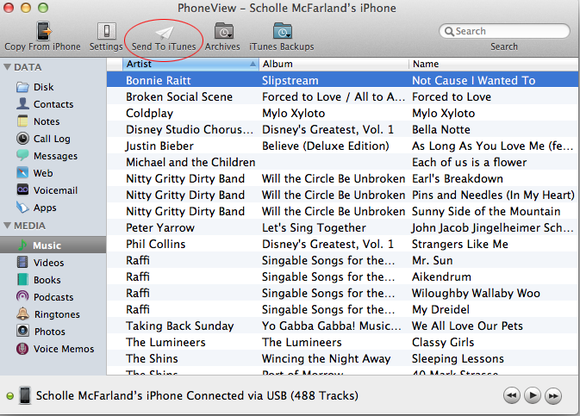 Ripped music: If you spent hours ripping CDs to your iTunes library and the songs remain on your phone, there’s hope. Apple doesn’t make it easy to restore music from your iPhone to your Mac, but it is possible. With a tool such as Ecamm Network’s $30 PhoneView, you can extract data and media from your iOS device. Just jack in your device, fire up PhoneView, select the kind of media you want to extract, and—if it’s music, for example—copy it directly to your iTunes library by clicking Send To iTunes. Apple doesn't make it easy to restore music and other files from your phone to your Mac, but it is possible with an app like Ecamm Network's PhoneView. Calendar and contacts: What if you don’t use iCloud, but you have synced your calendar and contacts to your still-functional iPhone? In that case, create an iCloud account if you don’t currently have one, sign into it, and ask your iPhone to sync your contacts and calendars with iCloud. When you later want that data on your Mac, just create an iCloud account on it, configure iCloud to sync contacts and calendars, and your data will appear on your Mac in short order. Do you regularly delete images from your camera card? If the answer is “no,” today you’re in luck. Keep those cards available, so you can download the images to your new or repaired computer. Know any other unintentional backups that might cheer up a fellow Mac user suffering from hard drive failure? Share your tips in the forums.